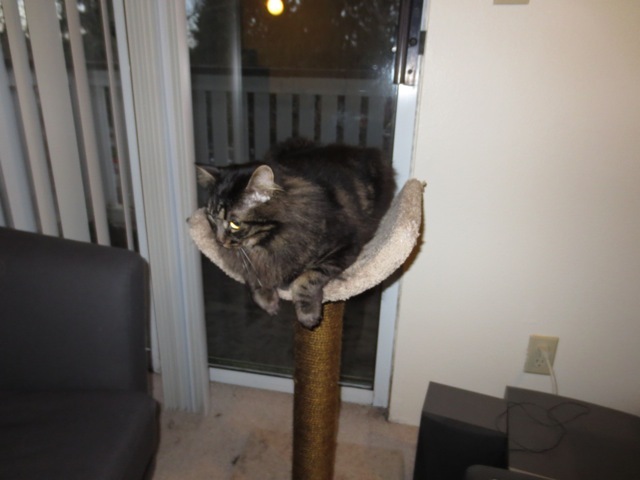 fourwhitepaws: Mr Hershey gets a tower! I recently heard from Mike, Hershey's new human. It sounds like everything is going quite wonderfully!! Hershey has a new cat tower that he just LOVES!! 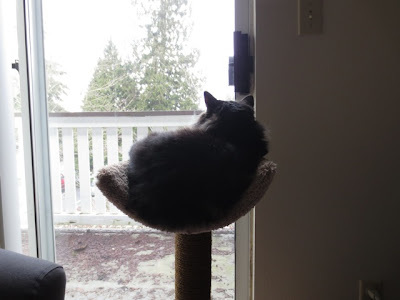 Hershey loves his cat tower, keeping an eye on the neighborhood is one of his new hobbies. I leave the blinds open for him in the morning so he can sit up there all day to his heart's content and watch. On President's Day I had the day off and there was a bird of prey flying around our neighborhood and he was absolutely transfixed by that, he spent all afternoon in that window staring out. When I come home, if I stand at the right place in the parking lot I can see into that window,and he's always up in that tower now when I come home. Otherwise he's just looking to socialize and play after I get home and being a great cat and my best friend! Unfortunately I don't have a good play photo since he's so active and feisty he doesn't stay still! Yea!! I'm so happy for Hershey and Mike - glad they found each other! It took a while, but Hershey definitely has a fantastic forever home now! Oh this makes mom and I SO happy! I am so happy he has such a wonderful home with someone who obviously loves him. That's so nice! I'm glad Mike sent you some pictures and I hope he writes to you now and again. What a success for you and Hershey. Aw, Hershey is so happy and I'm glad Mike let you know! Love the cat tower! 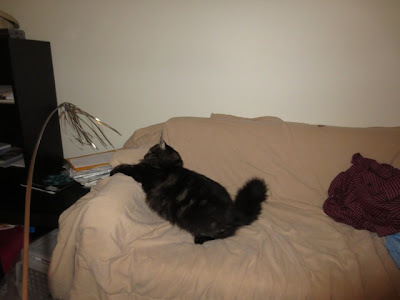 Cats love to be up high looking down, and Hershey seems to really enjoy his new perch with a view. I am glad he is an indoor cat where he will be safe. He is definitely the king of his domain. Nice to see new photos of him. The text Hershey's new human shows how much he already cares for him. We are VERY happy Hershey got lucky and the right guy picked him. That's a nice cat tower! A purrfect match. I'm pleased that you get updates...and even more pleased that you share them with us! That is a wonderful cat tree. I don't have a cat tree, but I do have several window perches and I'm allowed way up high on the refrigerator. It's fun up there too. Please stop by our blog when you get a chance... we have something for you! What a great story! Did you bring them together?? Good job! Lucky Mr Hershey! What a nice story! I don't care what else I read or hear about today.....THIS made my day!! "Otherwise he's just looking to socialize and play after I get home and being a great cat and my best friend!" I have tears in my eyes!I couldn't be happier for Hershey AND Mike!!! This is just wonderful! You must feel good about all your efforts on Hershey's behalf. He and Mike are off to a great start. I am so glad you brought these two together. Hershey waited such a long time for the happiness he now has thanks to you. Please keep us updated! Nice to have such good news. Thank you kindly for your comforting words of sympathy about our dear Chica. Oh Mr Hershey, aren't you a lucky boy to have such a good life. We all wish we had a fine tower like that.